Last Sunday my cooking friends and I had another one of our famous themed gathering with ice cream being the feature star. With over 15 of us and many brought in more than one flavour of homemade ice cream, the selection was dazzling. Our host foodpr0n roughly divided the event into three segments. First, vanilla ice cream taste off. 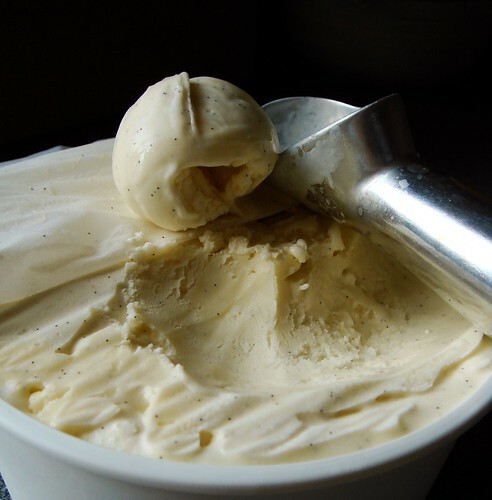 A bunch of us made our favourite vanilla ice cream recipe and we had a side by side taste test to determine the crowd favourite. 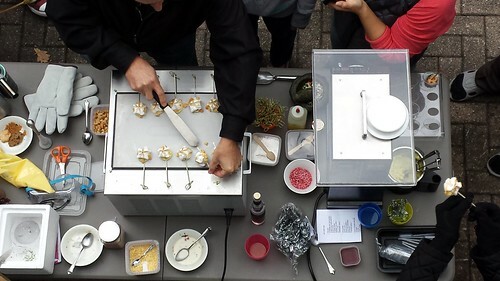 The tasty contenders included recipes from Jeni’s, America’s Test Kitchen, Melissa Clark, David Lebovitz, Thomas Keller, Alton Brown, and Martha Stewart. After multiple rounds of tasting, our decision was deliciously split between David Lebovitz’s and Melissa Clark’s recipe. All seriousness aside, we then proceeded to make our most outrageous vanilla sundae creations with homemade sauces like bourbon caramel, chocolate magic shell, feuilletine, pie crust pieces, cookie crumble, and almond brittle. Next it was play time with chef John Placko of Modern Culinary Academy. 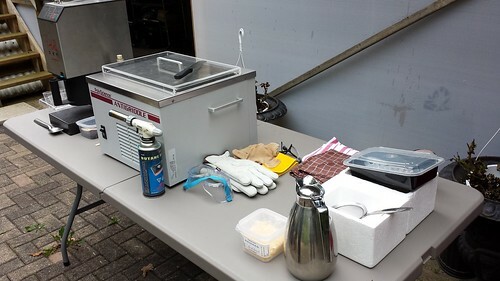 He showed us how to use liquid nitrogen to create frozen shattered fruit, instant pineapple mint sorbet using pacojet, frozen lemon meringue pie pops with anti-griddle, and carrot ginger ice cream made from stand mixer and liquid nitrogen. It was a treat for our culinary curiosity and our taste buds! It started getting chilly and we all retreated indoor but there were more ice cream and frozen treats! It was time to bring out all the different flavours of homemade ice cream, sorbet, ice cream sandwiches, and dessert. The trough was once again filled to the brim but this time it was bursting with colour. Some of the selections included: pandan with gula malaka, taro, boozy Manhattan (inspired by the cocktail), goat cheese with roasted figs, pumpkin spice, roasted pistachios, chocolate cherry sorbet, peanut almond milk, SOMA hot chocolate, peach sorbet. Good thing we did not have to pick favourites! As for my contributions, I decided to make dessert out of my homemade ice cream. 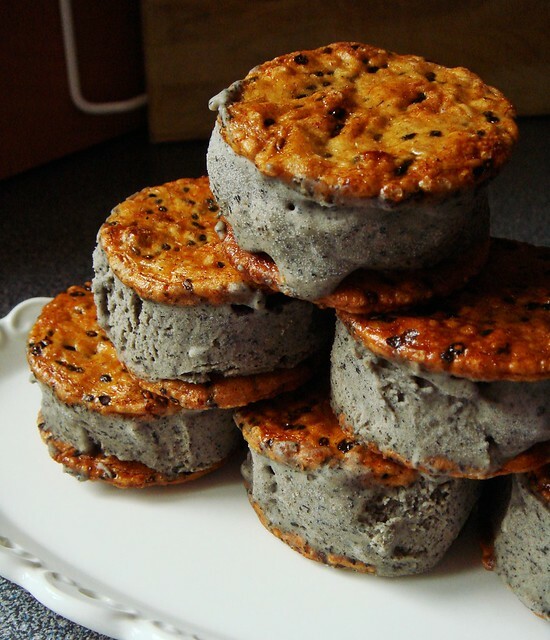 I sandwiched Triple Black Sesame Ice Cream between Soy Sauce Glazed Senbei Rice Crackers for sweet and savoury combination. The ice cream was made with triple dose of sesame using tahini, ground toasted black sesame, and black sesame Okinawan black sugar syrup. It was a little unusual and my friend loved the combination. 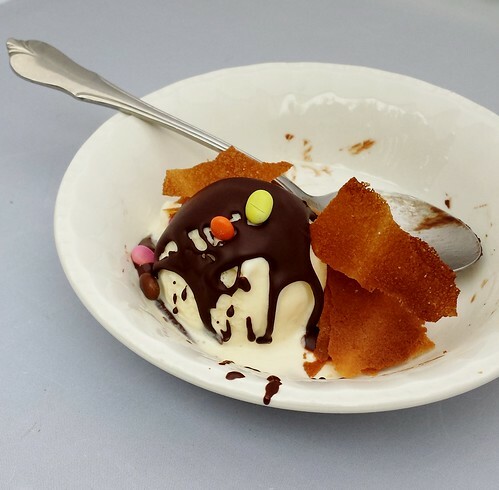 The ice cream was based on Jeni’s Splendid Ice Cream Base (recipe on food52) with the addition of 1/2 cup tahini, 1/2 cup ground black sesame, and 2 tablespoon black sugar syrup. My piece de resistance was Baked Alaska My Way. 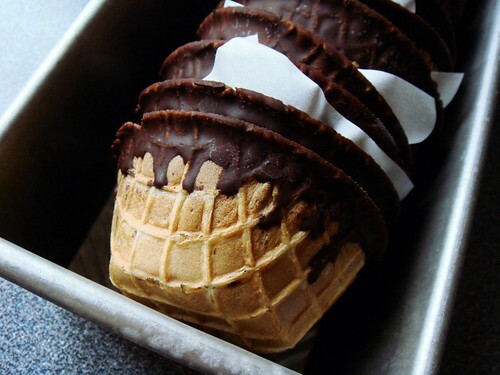 The last two years I had the idea to make homemade drumsticks ice cream cones yet somehow procrastination got in the way. I thought Ice Cream Day would be a great opportunity to finally bring it to life but practicality made me think twice. With so many different ice cream to taste, nobody in his/her right mind would eat a whole ice cream cone by him/herself. I needed something a little more suitable for sharing. 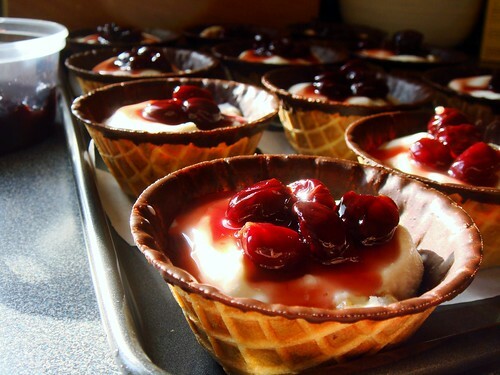 When I saw mini waffle bowls at the store, I knew I found my inspiration. My Baked Alaska consisted of chocolate-dipped waffle bowls filled with homemade brown butter almond brittle ice cream, roasted Niagara cherries, and brûlée Italian meringue. Obviously I needed to split the work over several days because each component needed time to chill in the freezer. I made a chocolate coating using coconut oil and dark chocolate. I ladled the warm coating into each waffle bowl, swirled to coat the interior, and poured out the excess. I froze the bowls in the freezer to set the chocolate. 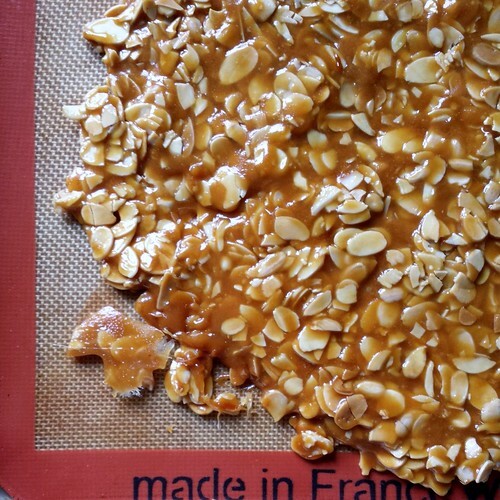 I made the almond brittle according to recipe in Jeni’s Splendid Ice Cream At Home. It was simply a caramel cooked to 300F with toasted sliced almond mixed in. I folded in 1 cup of chopped brittle to the brown butter ice cream. 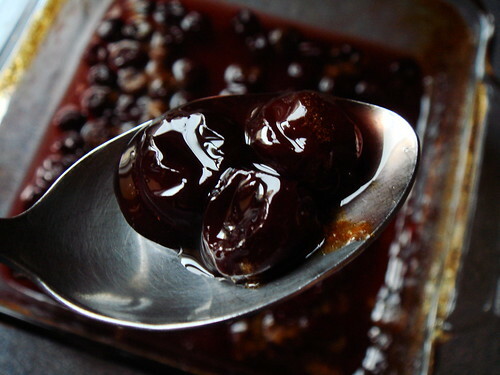 The roasted cherries also needed to be made ahead of time and fully chilled. Lucky for me, I stashed away sweet Niagara cherries this summer and the roasting concentrated the sweetness some more. It was hard not to snack on them. The touch of sugar and cornstarch created its own syrup for the roasted fruit. Finally it was time to put everything together! I squished 1/4 cup scoop of softened brown butter almond brittle ice cream into each waffle bowl and flattened it with a rubber spatula. The bowls returned to the freezer to set. Next I spooned a generous tablespoon of roasted cherries and syrup on top of the ice cream and chill them some more. In the mean time, I made a big batch of Italian meringue using half a dozen egg whites. 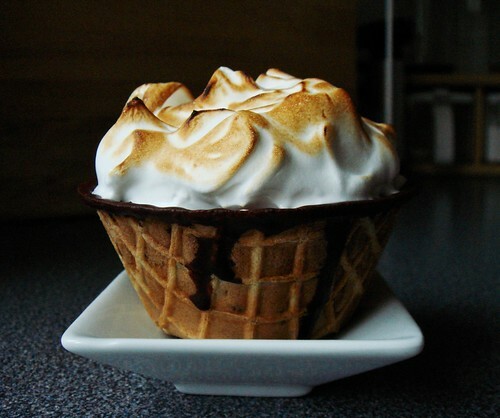 When the meringue cooled to room temperature, I piled huge dollops of it on top of each ice cream waffle bowl. 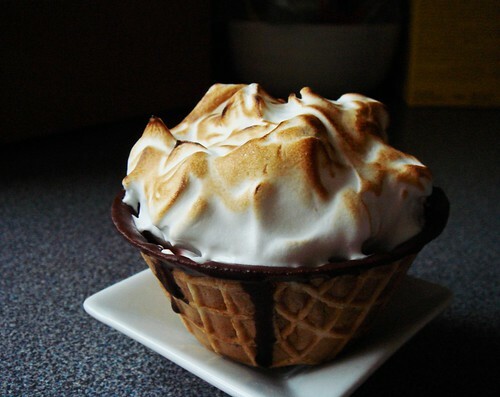 I nudged the meringue using a spatula to anchor to the edge of the bowl and made attractive peaks and swirls. Off to the freezer again to set! Due to the high sugar content of the meringue, it would not freeze hard in normal home freezers. At this point, I packed them in individual containers so my friends could take home without smashing them up. 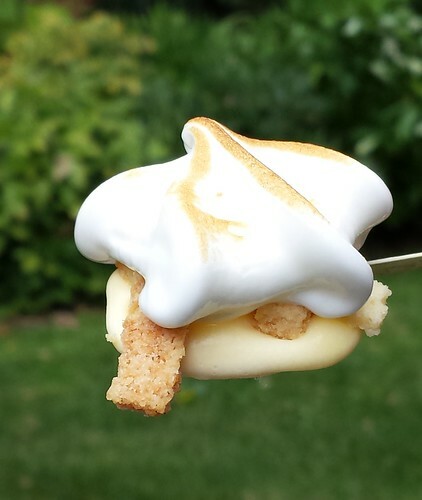 Just before serving, take a blowtorch and lightly toast the meringue until golden. Voila! Dessert By Candy’s Baked Alaska. 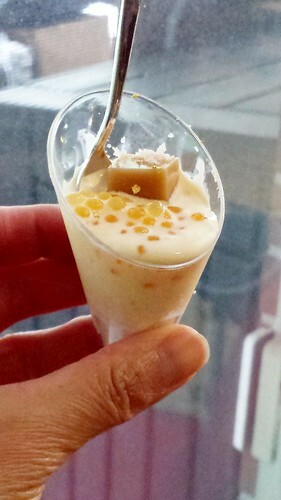 This dessert is most certainly labour intensive but all the work is done ahead of time. 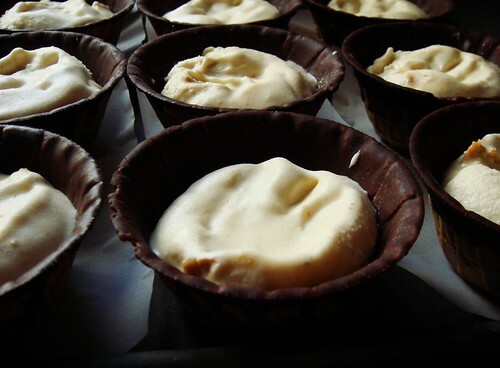 If freezer space is not at a premium, it is a wonderful dessert for dinner party. 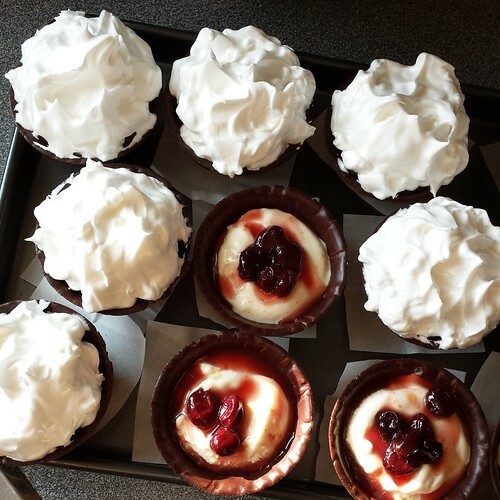 You simply need to set the waffle bowls on pretty serving plates and brown the meringue just before serving. 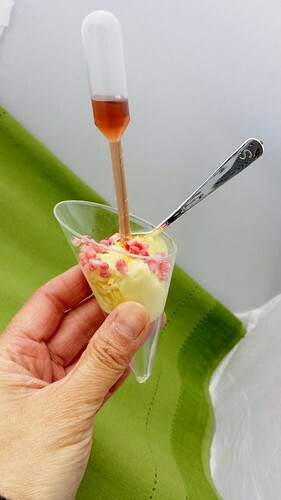 It was a huge hit on Ice Cream Day and I hope to make this again with entertaining season around the corner. I hope you will try it too!